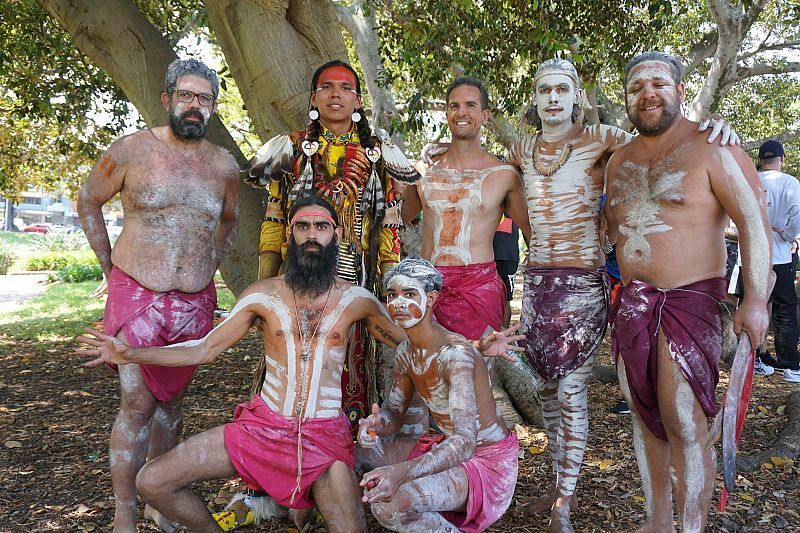 Indigenous performers from Australia and Canada pose for a photo at the Yabun Festival in Sydney (1/26/19) (image supplied). Given the historical injustices meted out against Indigenous peoples around the world, reparations have to be considered to make amends. A NUMBER of countries – Canada, New Zealand, the United States, Sweden and Australia, to name a few – have struggled to mend relations with their native populations. Canada, New Zealand and the U.S. have made efforts to recognise native populations in their constitutions or through treaties, while Sweden and Australia have failed to do so — but have, in contrast, made public apologies and created policies that ensure indigenous representatives are elected to represent their respective communities. Australia and the United States are often compared: similar in size, culture, and both liberal democracies, they serve as good examples of contrasting ways to address reparations. Native peoples of both Australia and the U.S. suffer from a lower quality of life as a lingering consequence of colonisation. Both the Australian and U.S. census show us that the unemployment rates, health disparity, sexual abuse, incarceration, mortality rates, substance abuse and poverty rates are significantly higher in the indigenous populations than non-native populations. For example, Aboriginals and Torres Strait Islanders make up 3.3% of the Australian population but account for over a quarter of the total Australian prison population. Similarly, Native Americans are incarcerated at a rate 38% higher than the U.S. national average. What attempts have been made to address these challenges? Reparations for these underserved communities have been a topic of interest among activists and governments alike. Beginning in 1975, several laws and movements were made to restore the rights of Aboriginal and Torres Strait Islanders, including the Native Title Act 1993, which allows Aboriginal people to file a claim to have the rights to negotiate against the development of the land through the Federal Court, amongst other things. Unfortunately, Aboriginal communities have found it nearly impossible to prove ‘continuous connection to the land’ as is required. Even if the claim is accepted, this does not mean exclusive land rights are given. The U.S. passed the Indian Appropriations Act in 1851, which was created to keep tribes contained (they were not allowed to leave without permission). Native Americans have been granted plots of land known as "Indian Reservations" but the communities living on reservations are still highly regulated, most unemployed and living in poverty. While they may own a certain amount of land on paper, the Bureau of Indian Affairs regulates it. There have also been attempts at acknowledging wrongdoing. For example, in 2008, former Prime Minister Kevin Rudd issued a formal apology to the Indigenous people of Australia. The following year, former President Obama issued an apology to Native Americans (although it wasn't highly publicised). Reparations typically come in the form of payouts, but determining how much money should be allotted to these communities is often an area of contention. In Germany, the Claims Conference was established in 1995 to act as an advocate for the social welfare and health needs of Jewish victims of Nazism. As of 2012, Germany has paid $89 billion (U.S.) individually to Holocaust survivors and to Israel. These amounts have been determined through multiple negotiations between the Claims Conference and German Government. After years of Japanese American activist groups urging the U.S. Government to make amends with former internees, the Civil Liberties Act of 1988 was established. The U.S. paid over $36,974,240 (U.S.) to Japanese-Americans for their forced internment during World War II. This amount was decided upon after the U.S. received 26,550 claims totalling $142,000. The Justice Department set a $100,000,000 limit on the total claims. Native land rights tend to fall under a different umbrella. If we look simplistically at the value of the land that would have inherently been indigenous owned, that amount skyrockets. There is no established method for calculating reparations and many varying opinions abound. When discussing reparations for slavery in the U.S., some experts suggest looking at stolen labour. 70 years of slavery (1790 to 1860 period only) times two million slaves (average number in the period used). Then times that by 365 days per year, times 10 hours of work per day times $7.25 per hour (a common minimum wage in the U.S.). This comes to $3.7 trillion which is then divided by the 40 million descendants of African American slaves living in the U.S. today, averaging around $1.5 million (U.S.) per person. While each situation needs to be evaluated on a case by case basis, let’s accept for a minute the idea that our country’s natural resources rightly belong to their native inhabitants. The natural resources for the U.S. are valued at approximately $45 trillion (U.S.). In 2015, U.S. mining companies paid an estimated $18 billion (U.S.) in federal, state and local taxes. The Bureau of Indian Affairs has a proposed 2019 budget of $2.4billion (U.S.) to serve the 573 federally recognised tribes across the U.S.. 68% of that funding is directly used for Native American tribes. The other 32% of that funding goes to operate the Office of Indian Services. 88% of Indian Reservations remain undeveloped because of Federal control which prohibits Native Americans from capitalising on their natural resources. Indian Reservation casinos are often viewed as a special privilege for Native Americans. But even here there are complications. Fewer than 15% of Native American tribes operate prosperous casinos. These casinos are still federally regulated, and over 400 tribes are not federally recognised; meaning they cannot operate a casino. As of 2014, only 242 tribes in 28 states operate casinos, but these casinos are often in remote areas and do not receive enough traffic to generate large profits. In addition, Native Americans pay federal income tax on any income they earn, including casino earnings. Australia earns $19.9 trillion (U.S.) from mining per annum. The Australian Mining industry paid $130.93 billion (U.S.) in federal company tax and state and territory royalties between 2015-16. From 2015-16, the Australian Government spent $23.64 billion (U.S.) (6.1% of total direct government expenditure) on services for Aboriginal and Torres Strait Islander people. But only 18% of that budget was used for Indigenous-specific services. The rest of the budget was attributed to general Government expenditure, the cost of providing services in remote areas and social security. The argument that native people should be entitled to the revenue that comes from their country’s natural resources is not necessarily on the table. However, these numbers are brought up to showcase that demands for tribal sovereignty should not be out of the question. This would mean that federally recognised native people would gain land ownership and be legally recognised as an independent nation. Native people want real property rights, with the autonomy and resources to develop, sell, and buy more land. Monetary reparations will continue to be an important part of the conversation, particularly if restoring native land rights continues to be pushed to the side. Working towards equality through reparations is a multi-faceted issue that cannot easily be resolved in one fell swoop, but there are immediate steps that can be taken now. Small demands, like the U.S. issuing a public apology to Native Americans and the Australian Government changing the date of Australia Day out of respect for Aboriginal people, are stepping stones on the path to positive, impactful reparations. 2020 Presidential Candidate Elizabeth Warren recently said that Native Americans should be “part of the conversation” on reparations. “I fully support the Federal Government doing far more to live up to its existing trust and treaty responsibilities and that includes a robust discussion about historical injustices against Native people. [Tribal nations] deserve a seat at the table in all decisions that will affect the well-being of their people and their communities." As the election pushes forward, this is a conversation that is likely to become more mainstream. Kaya Hartley is a recent journalism graduate from the University of Utah, and an intern with the United States Studies Centre.